This was on my must try place for a while now and was finally glad when we finally went there! Situated in Randwick, Sydney, this place serves a combination of French and British food. The menu is quite intensive, ranging from fish, to white meat to red meat. They also have two different types of degustation, one of them is daily which includes 8 different types of dishes (including dessert) and the other is their famous once a month Sunday degustation meal. I have yet to try the degustation menu, however, Hubby went for a friend’s dinner and he said it was fantastic – great value and great food! We didn’t have the degustation the last time we were there. 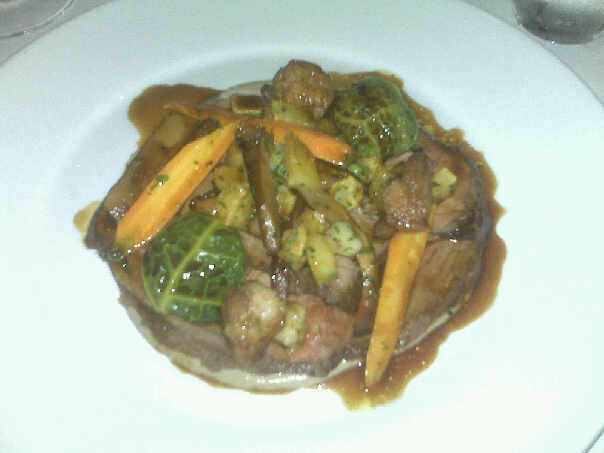 Hubby ordered the grain fed rump, oxtail with sweetbreads and bone marrow – this dish was delicious. The grain fed rump was cooked to perfection – medium rare and the bone marrow was soft and tender. Served with baby carrots, greens and onions this dish was simply divine. 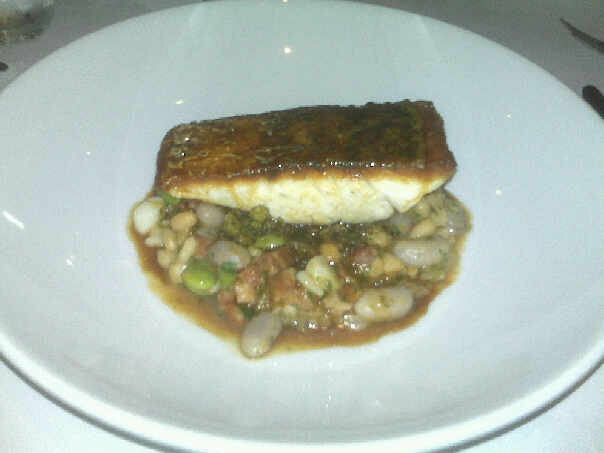 I ordered the pan fried barramundi with a cassoulet of braised pork belly. The fish was fresh and tender, the cassoulet of braised pork belly was unbelievably rich but extremely tasty. It was a great compliment to the pan fried barramundi. We ordered a side of roasted potatoes with beef dripping, rosemary and garlic. 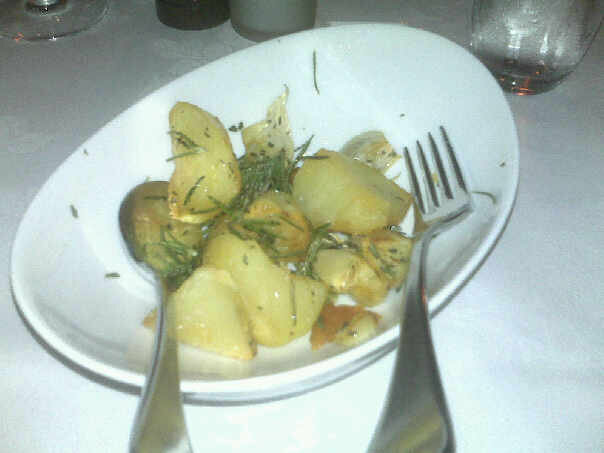 These potatoes were scrumptious! Slightly crunchy on the outside and fluffy and moist on the inside… the best roasted potatoes I have ever had. Dessert was bread and butter pudding – and believe me, when I tell you that Restaurant Balzac makes the best bread and butter pudding! Unfortunately for us, I didn’t take a photo of what the bread and butter pudding looked like! I took a photo of what was left…. NOTHING! 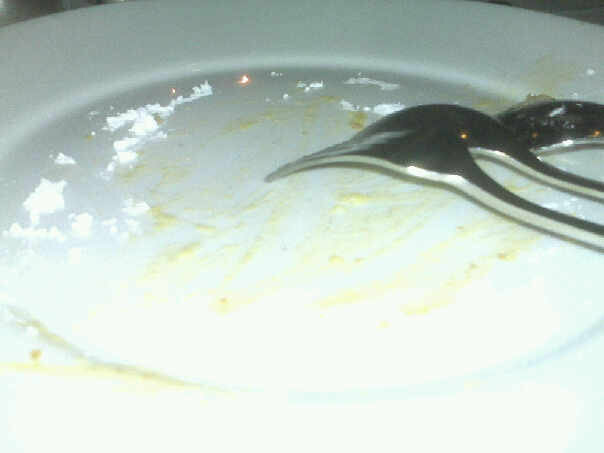 We absolutely demolished the bread and butter pudding, I think we even licked the plate and left nothing! It was rich, but not sickly, it was moist and melted in your mouth… it was heavenly! I think we may have to go back there just to have the bread and butter pudding! I think this dessert is one of their specialty and a must try for those who dine there. I love this place, remember you took me after my exams. I had the beef and that was really good. Also remember the food event, cant remember what its called now, and the dessert they made, man it was awesome!! ya you had a diff dish – dont think i have the photos for that one! i am just hungry looking at the pictures! Fantastic!! Other place to eat when I visit the end of this year. Might make me think of my 2nd home. (Sydney being the first!! ).